Explore the West Rim of the Grand Canyon on this guided, full-day tour from Las Vegas. After a hotel pickup, set out for a scenic drive through the Mojave Desert, making photo stops at the Hoover Dam and Joshua Tree Forest. At the Grand Canyon, meet members of the Native American Hualapai Tribe, take a walk on the popular Grand Canyon Skywalk or just explore at leisure. Transportation by 14-passenger mini coach and lunch are included. This full-day tour begins with an early morning pickup from a Las Vegas hotel by a professional tour guide. Recline in comfort and enjoy the views of Las Vegas while driving into Arizona for a photo stop at Hoover Dam. Continue on through the Mojave Desert, taking in the views of the landscape through full-size windows. Upon arrival at the Grand Canyon West Rim, take three hours to spend at leisure. Stop at Eagle Point to take a walk on the popular Grand Canyon Skywalk (own expense), or sit back and enjoy the majestic views of this natural wonder. Next, head to Guano Point for a short hike and photos of a lifetime. 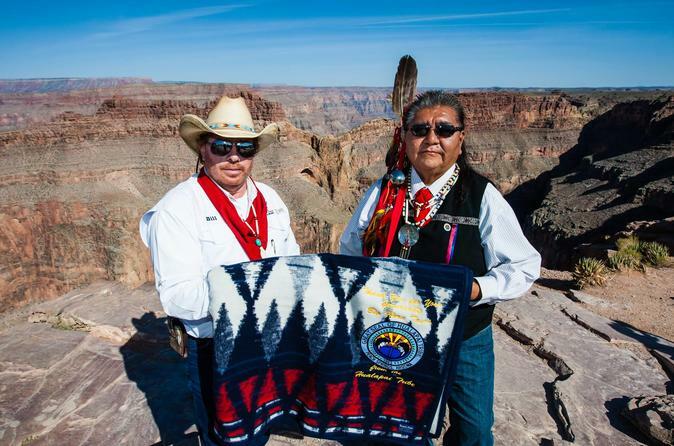 During your visit to the Grand Canyon, meet members of the Native American Hualapai Tribe. A stop will be made at the Hualapai Ranch for a full, hot lunch. On the drive back to Las Vegas, make a photo stop in the Joshua Tree Forest. Then arrive back at your hotel in the late afternoon, leaving plenty of time for you to enjoy a night out on the town.